A quote rang through Sams head and he repeated it “The supreme art of war is to subdue the enemy without fighting.” He sighed to himself,that quote WAS right.He stood up and shook the snow from his pelt. Moon twitches her ears and gives a small yawn before closing her eyes. She sticks out her tongue slightly before yawning again. "We'll talk when we wake up," She yawns and falls asleep, with her head on his paws. Frozone flicked his ears and agreed. Without another word, Frozone fell asleep. Moon rolls into her hole as she sleeps and stretches out her limbs, slightly. Frozone flicked his ears back and forth in his sleep. He yawned and slept till morning would arrive. Moon opens her eyes and yawns widely. She stands up slowly and then winces as she hits small rock. She sighs and walks away from it slowly, her eyes still half closed. Frozone heard movement and opened one eye. He sat up slowly and watched as the sun rised. Frozone shook his pelt and yawned. Moon stretches slowly and then falls into the snow. She giggles, "Look, I'm a snow man." She rolls around in the snow then stands up and looks at the snow on her face. "It's not cold," She remarks and shakes her head. Frozone laughed. "I told you before, only if it touches your nose." he replies. He leaps in to the snow and shakes his white pelt with a smile. Moon rolls her eyes. "It felt weird. Look, It's stuck in my fur," She giggles and points her ears to the ground. She shakes her head and watches as some snow comes out of her bangs. "It won't come out," She groans and paws at it. Frozone laughed. "It's gone all sticky to your fur." he replies, hiding his smirk. Frozone shook the snow out of his pelt. Moon groans. "Now I sparkle," She giggles and lifts her head, letting her bangs hide one of her eyes. She twitches her ears and looks over at him. "I know your trying not to smile," She comments and paws at him. She pushes him lightly and smiles. "Don't make fun of a female," She comments. Frozone smirked and stood up after being pushed lightly. "Sam's a girl, does he count?" he joked and flicked his tail with a smile. Sam listened to Frozone and growled,then looked at the two heart marks on his shoulder and hip.He snarled,he liked the hearts and now,people think its 'girly..' He snarled and sat down. Moon rolls her eyes. "If Sam is a Girl than you are too, Frozone. 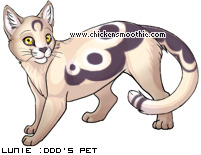 Don't tease others because of their markings," She says lightly and tackles him. Sam snorted,he liked his heart markings...They showed compassion and kindest,at least to the ones he loved..A low sigh escaped Sam's maw as he stood up and shook the ice crystals from his pelt and slowly walked past Frozone and Moon,not even giving them a friendly nod,his eyes gazed over to Allanie,the harsh turquise eyes seemed to melt into ice,he slowly walked over to her and said "Hi Allanie." Allanie looked up from eating for a LOOOOOOONGGG time. "Hey, Sam! Enjoyed the meat?" she asked in her peepy mood. She looked at his ruffled fur. "What happened...?" she asked. "Did you...?" she trailed off. Allanie walked towards him and started licking his fur straight. "I wasn't talking about his markings." Frozone replied simply. He tackled her back and pinned her gently. Moon rolls her eyes and wags her tail. "I do have an advantage. I can see everything around us with my right eye. There fore I know a rabbit is hopping behind you," She giggles and wiggles under his weight. Frozone looked behind him and shrugged. "And you should know that right my eye is red because I'm blind." he sighs and stands up. Frozone shook his pelt and closed his left eye as he looked around him with his right eye. Frozone saw nothing but blackness. Allanie hurried over to smooth Sam's pelt. "Did you get into a fight?" she asked him curiously. She licked his fur once then added; "With Fro again?!" she yelled. "What was this about now?" Allanie asked quietly. Moon licks his face softly. "But you still have one eye," She whispers and nudges his shoulder. She blushes slightly before sitting down, cursing her pale pelt. "Yeah, just one little eye. I loved looking at my surroundings and views with two eyes as a pup. And now I have to suffer being half blind. I hate it." he snarls quietly and walks off with his tail flicking dangerously. Frozone opened his left eye again and looked at where he was going carefully. Sam face fell hot as she licked his fur..He replied "He started it..Then we just got into an argument..Then we fought,but Moon stopped it. His blues eyes had a hint of embaressment in them,but he kept his face to a neutral smirk. Moon sighs and follows after him. "It's better than being completely blind," She whispers and licks his flank. She whined softly and kept pace with him. Frozone growled quietly, not wanting to be touched. "I cant call it better, no matter what." he replies and shakes his head. Moon whimpers softly and looks down. "There's always a brighter side, Frozone," She whispers and steps away from him. She closes her eyes slowly and continues to back away. Frozone turned around and stared at her with his two colored eyes. "Sorry." he whispers. "I get angry when I think of my right eye.. It annoys me having to be different when everyone can see normally. I'm just glad Sam doesn't know I'm half blind, or he'd call me names like everyone else did in my old pack". Moon walks toward him slowly and pushes his jaw lightly. "If he did, I would make it so he could do nothing but make unintelligent noises," She whispers and smiles at him. She wags her tail slowly and bows playfully. Frozone looked at his paws. "Would you be my mate?" he mumbles. "I don't know anyone else besides you who actually understands me and is there when I need it." he adds. Frozone looked up from his paws and smiled shyly. Sam softly walks away from Allanie and bumbs into Frozone on purpose,he smirked "Oops." Frozone's ears flicked as he heard Sam. He ignored him completly, hoping the male would leave. Sam grinned "Its so weak and sad to see someone sooooo strong ignore a challenge." He sat down,a large grin on his face,he was intent on showing up Frozone,he was not some arrogant male...not even close. Frozone rolled his eyes. "Who's the imature pup now, eh?" Frozone chuckled coldly. "I won't fight you, even if I get my eyesight back. I wont." he replies sharply and hisses. Frozone turned and looked at Sam with a cold glare. Sam snickered "Whatever." He slowly trotted off,leaving prints in the fresh snow.He smiled as one hit his white ear,the little snowflake perfectly blending into it. Allanie growled. "Why can't they get along?!" she said out loud. Sure, Frozone is kind of annoying, but there's no reason to fight!" Allanie thought. Frozone sat down and ignored Sam as he left. Fro flicked his ears back and forth. Grumpy old grizzly. Allanie went over to Frozone. "Why are you guys so angry at each other?!" asked Allanie. Sam growled back to Allanie "Leave him alone! He is only going to eat you!" Sam laughed softly and looked up at the cloudy sky then trotted off to the lake. Frozone stared at Allanie and stopped his glare. "He keeps starting things, getting me angry for no purpose whatsoever." he replies honestly and growls. "I wont hurt a pack mate." he calls to Sam.